That is a nice set. The short prints are frustrating, but it's a nice set to have. 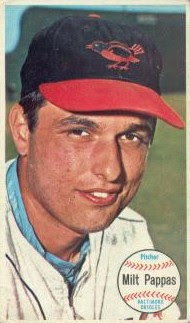 Milt Pappas has a very simular record to Hall-of-famer Don Drysdale, eventhough the Big D played in a definatel pitcher's park. Life is just not fair. Drysdale had a lot of help getting there, that's for sure. I think appearing in 5 World Series made a big difference in his successful candidacy.